Earn up to 64 reward points. Super jazz string with lighter tops. 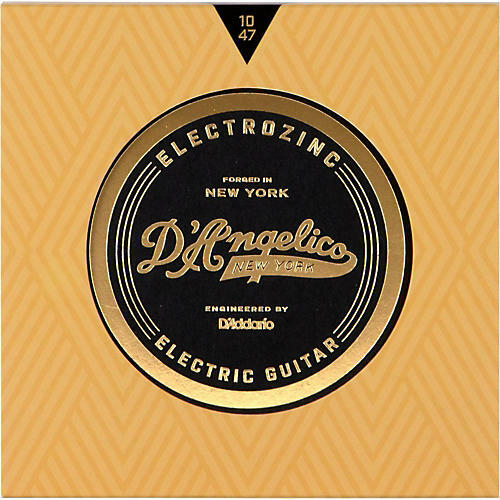 With a wound G-string, D'Angelico's Electrozinc Jazz 10's are designed for exceptional jazz tone and stability, while still prioritizing comfort. Co-designed and engineered by D’Addario, Electrozinc marks the return of the partnership between these two legendary brands. The story of the string begins more than 75 years ago. In 1938, John D’Angelico was already a living legend known for his signature archtop guitars, while John D’Addario was a young kid trying to expand the family string business. Their chance meeting would result in the invention of the world’s first modern round wound electric guitar string, the zinc-coated Bethanized Steel. Its sound was unrivaled in fullness, volume, and brightness. Its tone would be featured on some of the greatest records of all time. But the closing of the Bethlehem Steel plant in the ‘60s put an abrupt end to its production, leaving its sound unmatched for over half a century. Until now.